The road to becoming a musician is long and filled with many detours, each and every one of which holds a valuable takeaway for its starry-eyed residents. It’s a journey which has as much to do with music as it has to do with self-discovery and personal development. The aspiring musicians embarking on it need a visionary guide, one who can help them look beyond mere scales and notes and into the bigger picture, colored with the values and overarching purpose their music is meant to voice. This is where New World School of the Arts and its Dean of Music Dr. Daniel Andai come in. Having walked this very road himself as a professional violinist on 5 continents, a concert master, a conductor, as well as a student and a professor at New World School of the Arts, Dr. Daniel Andai has come to know first-hand all the overlooked aspects of being an artist. And he’s not the only one who has had the invaluable chance to tap into the school’s well of knowledge and wisdom. With former alumni like Tarell Alvin McCraney, co-writer of Moonlight; Lili Estefan, model and talk show host; Katie Finneran, Tony Award-winning actress, and Brandon Flynn, actor in 13 Reasons Why, New World School of the Arts has a history of fostering future artists’ talent and overall class. “My background and experiences showed me that I need to pay it forward. I have a responsibility to serve,” he says. And paying it forward starts with the admission process. A partner of Miami Dade County Public Schools, Miami Dade College and University of Florida, New World School of the Arts takes great pride in significantly reducing, and sometimes even eliminating, the financial bar so that talent doesn’t have to stay confined within financial restraints. “This is really important, and it is part of what makes New World successful. Students can focus on school and not only making ends meet,” Dean Andai says. Talent has the necessary space to unfurl, not only in financial terms but also in practical ones. Theory plays a key role in basically any proper music education, however, it should never play the only one. In that spirit, opportunities to put theory to practice are plentiful. Whether it’s via the school's award-winning jazz program, performing in concert halls for the community, or playing at special events, students dive headfirst into the challenging and exciting world of live music. “The students serve as ambassadors to New World. 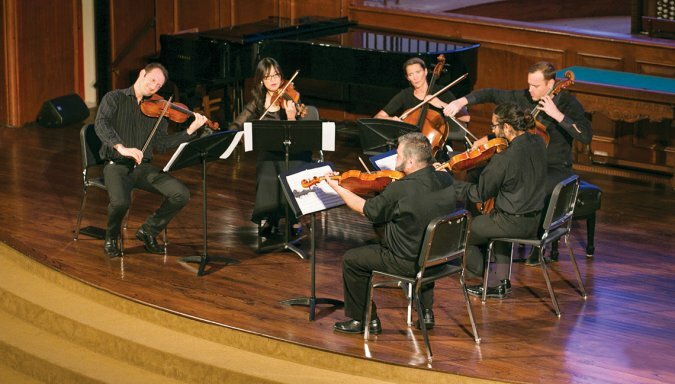 The music work is important for them as a grade, but how they will interact with the community can reveal how they will perform as community leaders,” said the Dean. “Community is very important. We partner with organizations and do what we can to be visible. All of our productions are open to the public,” Dean Andai continues. “Music is not just a source of fun. It does a lot of different things. It’s a global language, it’s a promoter of peace and it helps in brain development,” Dean Andai says. “Miami has a long way to go,” he said. “The city is very big and spread out, so it’s harder to reach people in a meaningful way,” Dean Andai notes. Nevertheless, it’s precisely these kind of challenges that mold musicians into community leaders. Hearing these words would probably make Dean Andai’s teachers proud, just like he probably feels when seeing his students continue the New World School of the Arts’ historic legacy.